Happy Record Store day. 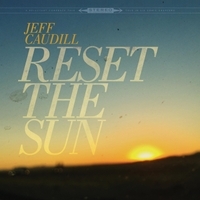 This week’s stand-out release is Jeff Caudill’s new 6-track EP/mini-album, Reset The Sun. It’s an alt-country road record about someone who has made “some questionable life decisions and is struggling with forgiveness and starting over“. Musically, it’s a ways away from Jeff Caudill’s previous work with Gameface. Here, we’re deep in the heart of Son Volt territory. And if anyone was disappointed with Jay Farrar’s recent blues-based album, then Reset The Sun can fill the gap very nicely. It’s country, but not Bro-Country. It’s rock, but not Dad-Rock. The song craft is exceptional. The break in the middle of ‘Tears In My Eyes’ is a particular favourite. And the playing is top notch, with the keyboards making a real difference on all the songs. So, if you looking for some slightly down-at-heart songs with a few upbeat hooks, then Jeff Caudill’s new release is for you. It’s available on vinyl and CD from all good record stores. And there couldn’t be a better day to try to track down a copy at one. Essential. Posted in Jeff Caudill, Uncategorized and tagged as Jeff Caudill, Music, Review.